Rosogolla and the first day of the Bengali New Year. Rosogolla — a cottage cheese ball dipped in sugar syrup — is the quintessential Bengali sweet. Here’s to a sweet beginning! Categories: Something Sweet | Tags: bengali new year, Noboborsho, Paila Baishak, rasgullas, rosogolla, sweets | Permalink. A spicy start to the Bengali New Year! It’s that time of the year again — eat, drink and be merry — for Bengalis. I decided to usher in the first day of the month of Baishak, the Bengali New Year, with a dish that Bengalis drool over — Chilli Chicken. 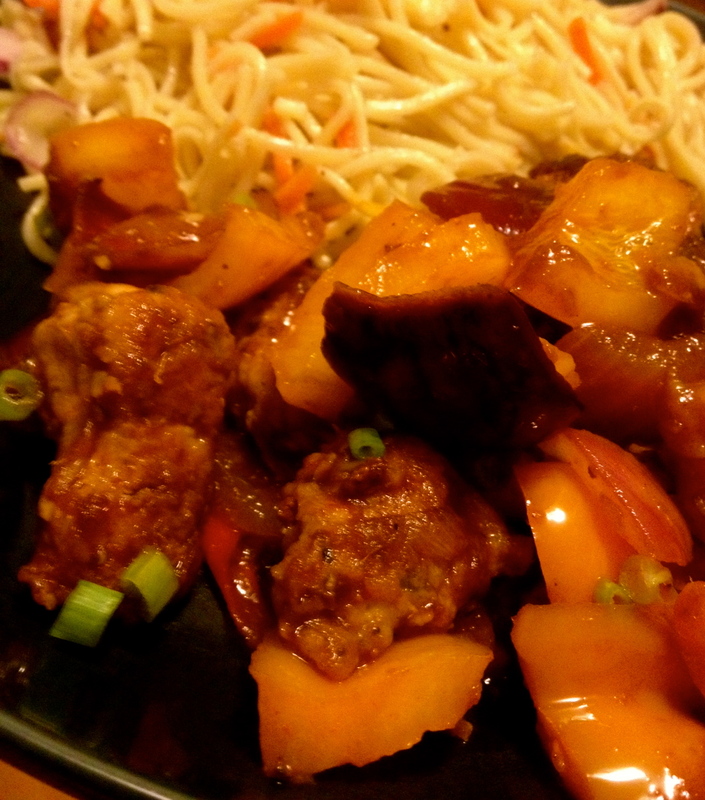 Dishing out an Indo-Chinese speciality, instead of a traditional Bengali recipe, was solely done to pleasure my tastebuds. I had been craving Chilli Chicken for long and the thought of family and friends indulging in a variety of delectable dishes back in Kolkata today, acted as a spur. Secondly, an authentic Bengali spread sounds no less than a luxury to me these days, for I lack in both time and energy to dish out an exquisite three to four course meal. So here’s to a spicy start to the New Year! 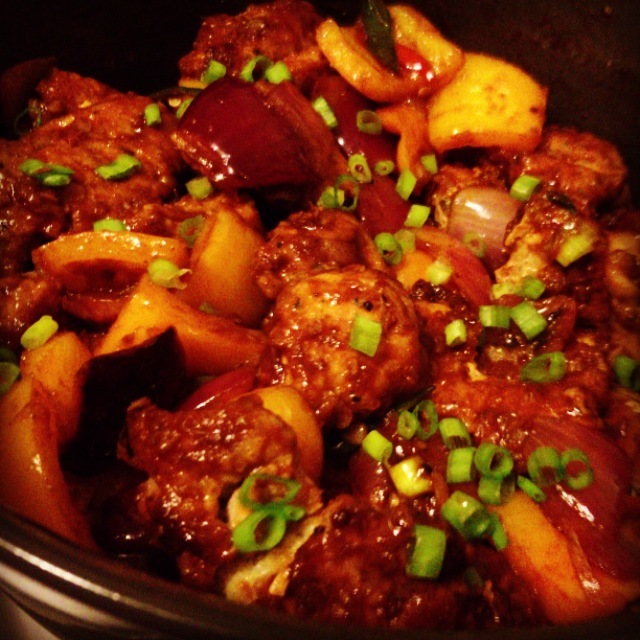 Categories: chicken, Non-vegetarian | Tags: bengali new year, chicken, chilli, chilli chicke, dry chill chick, indo chinese recipe, poila baishak, spicy chicken, spicy food | Permalink. Picture a dinner plate decked with a dome shaped jumbo scoop of white fluffy long- grained rice. A trio of vegetable fry (potato, eggplant and bitter gourd) lazing near the periphery of the rice bed serves as sentry. Basking in self-glory are seven mid-sized color coordinated bowls, stretching out to form an arc around the plate. Lentil soup with fish head, mixed vegetables, two different kinds of fish curry, and mutton drenched in gravy are heaped in order. The last two bowls nestling dry fruit chutney and rice pudding smugly await their turn to tantalize your sweet tooth. Drooling already?! Half of the Bengali population around the globe is actually going to savor this elaborate spread today to mark the beginning of the first day of the month of Baishak or the Bengali New Year. I belong to the other half. Gulping down dinner tucked away in the couch, eyes glued to the blaring television, will mark the end of my first day of the year. Therefore, to add a pinch of novelty to the otherwise mundane weekly dinner spread, I decided to fry maacher chop (fish croquettes). This way I won’t be confronting guilt the day after, taunting me as to how I would have to wait another year before I get a chance to make up for my gastronomical loss. Maacher chop happens to be one of my favorites. Making this delicacy serves three purposes. One, it automatically pushes the party button in my head, two, it helps me sweep up the peti (belly) pieces of the fish which we both otherwise dislike and three, it weaves in an aura of nostalgia. I confess making it is not a breeze but the labor that goes into preparing this tastebud stimulating snack is worth the trouble. 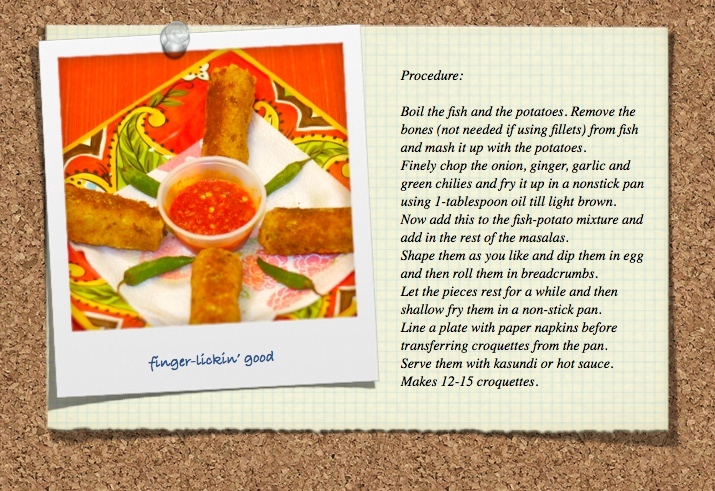 Here’s my recipe just in case you feel like undertaking this adventure. 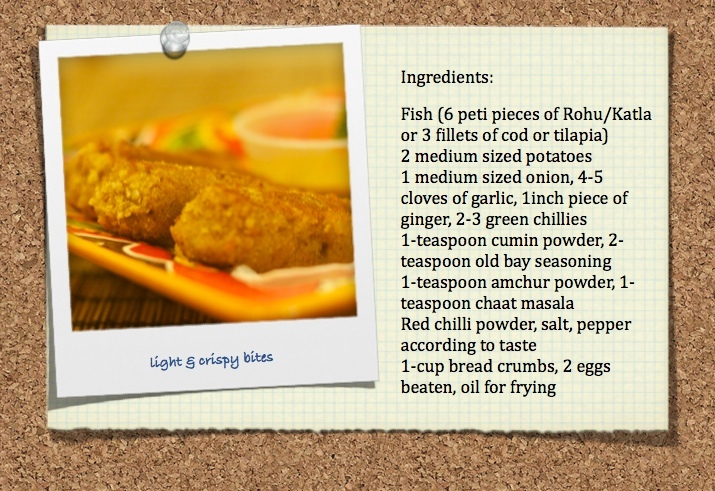 Enjoy these heavenly ‘crispy outside and fishy inside’ bites! Have a sumptuous New Year. Subho Noboborsho!! Categories: Fish, Non-vegetarian | Tags: banquet, bengali, bengali food, bengali new year, bhoj, fish, maach, maacher chop, poila baishak | Permalink.